Sales tax may apply when shipping to: AL(4.0%), AZ(5.6%), CA(7.25%), CT*(6.35%), FL*(6.0%), GA*(4.0%), HI*(4.0%), IL*(6.25%), IN*(7.0%), IA*, KS*(6.5%), KY*(6.0%), ME*(5.5%), MD(6.0%), MA(6.25%), MI*(6.0%), MN*, MS*(7.0%), NV(6.85%), NJ*(6.625%), NY*(4.0%), NC*(4.75%), ND*(5.0%), OH*(5.75%), OK(4.5%), PA*(6.0%), RI*(7.0%), SC*(6.0%), SD*(4.5%), TN*(7.0%), TX*(6.25%), VT*(6.0%), VA(4.3%), WA*, WI*(5.0%), WY(4.3%). The case looks nice and provides good protection. It has a very lightweight feel and isn't bulky at all. I'm very pleased with the case and wish I had known about it sooner. Slim case , good design but get a case friendly screen protector! 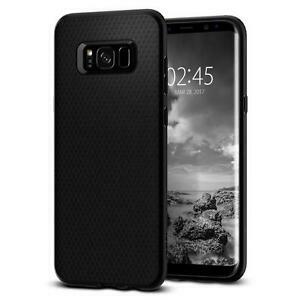 The black s8 phone case is simple and sleek, Fits perfectly on my phone even with a screen protector, and the shipping time was reasonable.